HELLTOWN BEER: Will Vuvuzela Make it out of the Group Stage? "If there are grounds to do so, yes. "We have heard from the broadcasters and other individuals and it is something we are evaluating on an ongoing basis." He continued: "We have tried to get some order with it. We have asked for no vuvuzelas during national anthems or anyone is making an announcement. I know it is a difficult question but we are trying to manage it as best we can. "This matter has been raised on many occasions and my personal view is that I would prefer singing. It has always been a great generator of a wonderful atmosphere in the stadiums and we will try to encourage them to sing because that is the strength. "In the days of the struggle, we were singing - we did not blow anything, we were marching and singing. "All through our history it is our ability to sing which really inspires and draws the emotions. "It is a huge debate and it will continue, but we did say that if one lands on the pitch in anger then we will not think twice and take action." I respect that he is trying to put the feelings of the fans over his own even while he does not prefer them. I also like that they have asked them not to be blown during the national anthems. I disliked the first couple games yesterday where those things were drowning out the anthems. I have gotten use to the ever present racket at this point. Mr. Jordaan's comments are interesting because I thought the topic was decided. The reason I am bringing it up here a 2nd time is due to the fact that it has created a unique TV viewing experience and is something that will probably be remembered from this years WC. A a so called future "touch stone topic" that will be brought up again and again in years to come by our friends at ESPN. 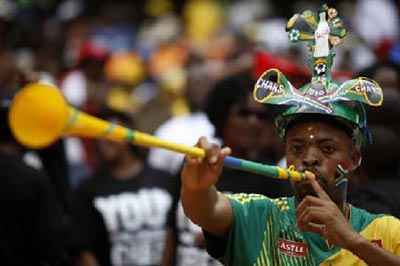 So look for each time the 2010 WC is mentioned... the Vuvuzela will be as well. ESPN just can't help themselves. Touch Stone Topic Example: "Tim Howard is one of the best keepers in the World, just so happens he plays for the United States." - Alexi Lalas. Over and Over. Example 2: Lalas dismissing every team in America's group. How about we prove that we can beat a nation of 2 million before stating that. Stay strong Alexi. Stay Strong.